You are the Homeschool Planner and as the planner, you will arrange the different parts of home education that will make homeschooling possible and make homeschooling proceed each day with as little chaos as possible. Parental issues aside, there are things about homeschooling that are easily within your powers to subdue, which I simply call "being prepared." That is what this section Homeschool Planner is about — being prepared. Within the pages of Homeschool Planner you will find articles I have written about the various aspects of planning homeschool and, if you are a subscriber, you can choose from hundreds of Printable homeschool planner pages. Pictured above is a two page spread from my homeschool planner from 1996. I favored a 2-page 5x7 grid during my first few years of homeschooling, when my children were both young and shared some subjects. 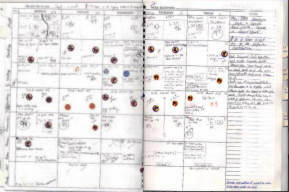 The planner page is dotted with little happy stickers, which represented a score of 100%. These stickers were more for me than for my children — they had their own sticker books. The links shown here are the "home pages" of the various sections in Homeschool Planner and are present in the 2nd row of the navigation menu at the top of each page in the Homeschool Planner. These specific links are not active in other sections of the website. If you go to a different section of donnayoung.org, the links will be replaced with links relating to that section. For example, in the Art section you will instead see links leading to other art sections in the 2nd row of the navigation menu. 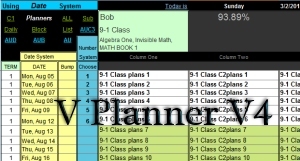 [An XLS File] There has been a great deal of interest in the V Planner. Most of the interest has revolved around how it handles lesson plans — whether it can do this, that, or the other. I designed the V Planner to do handle lesson plans in a way I would have liked (of course I am retired now) and, as a result, V Planner combines the best features of my subject planners and weekly planners. Go to the V Planner's home page to learn more about it. Printables: The Lists section has printable forms that deal with lists such as library books, reading logs, checklists, curriculum shopping list, goals, et cetera. Printables: Forms in the Administrative section deal with sorting out things such as attendance, grades, course of study, calendars, et cetera. This "browsing" area is incomplete by far. My apologies for that; it's just that I have this whole website to work on and projects take a while to complete. But for now, if you need a planner that is arranged by block width and height, you are in luck (sort of). I have grid planners grouped like that here [5x7 Grid Homeschool Lesson Plan Forms] and here [5x8 Grid Homeschool Lesson Plan Forms]. Both pages have the snowman planner. The 5x7 page has a planner that I made to resemble the planner I used for both of my children during the first 3 years of our homeschool — 2-page planner with 5 x 7 grid. Weekly Planners are incredibly popular and for good reason: your plans for one week are right there on one or two sheets of paper. Maybe one sheet of paper for each student, but they are still right there. Pictured here is a two-page weekly planner which can be used for 2 children or more as long as you have enough room in the blocks. Most of my weekly planners are the one-page type. The planners on this page are not the only weekly planners available at donnayoung.org so be sure to look at Donna Young's Homeschool Planner Sets before deciding which planners to use. What are Term and Subject Homeschool Planners? Pretty much the same thing. The difference walks in when they are specialized but what they have in common is that they are both designed for one subject (or class) and they are some of my favorite types of planners. While I have more Term and Subject Homeschool Planners than those shown on this web page, the ones shown are the basic types: a Quarter Planner, a Semester Planner, a 6-Week planner, a Science planner, and an English class planner. 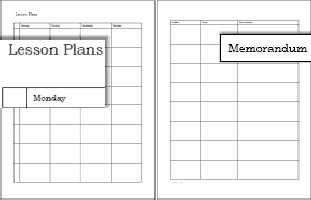 Be sure to look at Donna Young's Homeschool Planner Sets because many of those will have coordinating subject planners. What are Row Planners? A lesson planner that has rows instead of blocks and can be used as a daily planner or as a weekly planner. When used as a weekly planner, a week of lesson plans for one subject are stuffed into one row and it could be as simple as, "Math: Complete Lessons 6-10." Homeschool Journal is, for the most part, lined paper, some of which is decorated and some of which has a distinct homeschool purpose. The printable journals are sorted into four sections as follows: Journals with Borders | Decorated Journals | Journals with Titles | Plain Journals. Of course any of the journals can be used as lined school paper. Many years ago, an online friend named Sumi outlined how she planned unit studies. From her method, I put this planner together and, while I added to it, the planner would not have been possible without Sumi. The file is available in doc and rtf formats. Information and Printables: In the High School section I wrote about the basic steps to planning high school and provide printable high school forms. Printables: The vaguely named section Extra has forms that might come in handy such as notebooking templates, grids, cover sheets, and homeschool group printables. Printables Sets: Groups of files that have something in common. Sets will also have matching planner sets, some permanent and some temporary. Alexia is available in several formats, pdf, doc, rtf, and odt. The font used in Alexia is also available for download. The Colonial set is probably the largest set that I have and is publicly available as PDF's. YoungMinds subscribers have access to both PDF and Doc files. Marble is a pretty planner that I made 2001 or so. The Marble Planner is small and has six basic homeschool forms. Papyrus planner has household and homeschool planners and includes a matching calendar. Portfolio Planner has 7 basic homeschool forms plus a matching calendar. Fill in the name, days, and subjects at Portfolio X, click a couple of buttons, and you'll be presented with a filled Portfolio Planner. The Rich Text Format (RTF), DOC, and DOCX files were created with Microsoft Word 97 (not Works) or Microsoft Word 2002. My docx files were created with Microsoft Word 2007. Microsoft Word should open any of my word files successfully. Several other word processors might successfully open the RTF, DOC, or DOCX files. The Acrobat files [PDF] should open with Acrobat Reader 5 or higher. Most of the PDF files can not be "typed-over", but some can be typed on and those are called Typeable PDF. The Typeable PDF are marked with this icon and the description of the file will state that the pdf file can be typed on. The PDF files require the free acrobat reader. If you do not have the reader, it can be downloaded free from the Adobe Acrobat Reader web site. XLS and XLSX: The Excel files, sometimes referred to as MS Excel, will open with some applications that support spreadsheets; however, not all of these applications will support the formulas in my excel files. Because of this, some of my xls files will only work with Microsoft Excel. A few files have password protected worksheets. These passwords are not given out. ODT is an Open Office format. Open Office is an open source word processing suite and it is an alternative for those who do not have word or excel. OpenOffice changed hands a few years ago and I cannot recommend it because I have not kept up changes to the program. There are two other free office suites I know of: LibreOffice and Kingsoft Office. I urge you to research all three choices before downloading to your computer. If you decide to take the free software route, make certain to download the software from the true maker's website and not from one that has taken the software and injected adware. Be cautious!